Trần Thị Thúy’s world opened up after she read a magazine that was in both Vietnamese and English. It encouraged her to learn English. She then became an English teacher. Her classroom has often been on a computer screen because she wants her students to make friends all over the world. 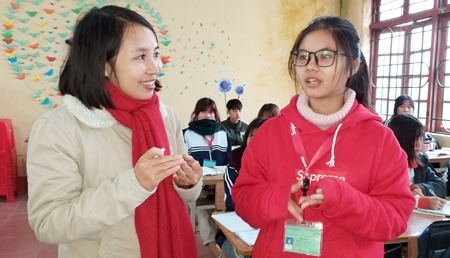 HƯNG YÊN — Teacher Trần Thị Thúy, 32, from Đức Hợp High School in the northern province of Hưng Yên remembered how her dream started, when she got hold of a bilingual magazine in 1999. “That was really an unforgettable moment. A new world opened up and I was inspired, so I pledged to study English as a way to help myself realise my dream,” said Thúy. Her determination empowered her to study and become a teacher of English to help local students connect with thousands of friends around the world by joining MEC (the Microsoft Educator Community). At an English class run by the teacher, students can have presentations in English and communicate directly with others foreign language students and specialists. They have really good skills of listening, speaking, writing and reading in English. Exploiting the ‘power’ of IT, Thúy has contacted teachers from Japan, Egypt, Pakistan and India to arrange inter-continental lessons via Skype. Her students can share views with students around the globe. And more impressively, she has recently been honoured as one of top 50 teachers across the world on the shortlist for the 2019 Global Teacher Prize for her outstanding achievements in education. The annual prize, an initiative of the Varkey Foundation, is awarded to teachers to recognise their outstanding contributions in teaching, their creativity in creating and researching and improving new teaching methods, quality and influence of teachers in the country and the world. The Đức Hợp High School Principal, teacher Hà Quang Vinh, said Thúy deserved the honour. “She is a pioneer in applying Skype in teaching, helping her students interact with foreigners including students and teachers from around the world. Her teaching methods also help improve students’ communication skills and better understand about others cultures,” Vinh told Việt Nam News. The principal revealed on Hưng Yên Province’s online newspaper baohungyen.com last week that Thúy had passed three rounds of interviews in writing and directly via Skype to receive the award. She and others among the top 50 teachers will participate in a series of activities in March this year in Dubai, the United Arab Emirates to compete for the 2019 Global Teacher Prize. Thúy still can’t believe how she has overcome hardships to realise her dream. Born and raised in a poor rural community of Đức Hợp Village in Hưng Yên Province’s Kim Động District, Thúy had little access to books during her childhood. Thúy said like many of her peers, at an early age, she often had to help her parents with housework after class. Thúy was never able to learn English. “What is it?” was the question she often asked when hearing about the language until a relative gave her a copy of Sunflower Magazine. The then rare bilingual English and Vietnamese newspaper stirred her passion and gave her a glimpse of the world beyond the village. “That dream empowered me to overcome all difficulties and study at the English language faculty of the Hà Nội National University of Education,” said Thúy. After four years, she graduated and decided immediately to return to her home village to teach English to local students. According to Thúy, in the world today, English has become the universal language, so not being fluent in this language means not grasping the opportunity to develop not only yourself but also society and the country. The dream of helping students learn English effectively with technology became more realistic after she completed a standard training course for teachers of English as part of the National Foreign Language Project 2020 and especially since she happened to know about the Vietnam MIE (Microsoft Innovative Educator) on Facebook. Within a month, she completed learning paths at the Media Education Centre and since then has had the most comprehensive view of education in the 21st century and methods to support student learning. “Now, I understand that education is not only about sharing or providing students with knowledge, but more importantly, discovering their talents and giving them chances according to their abilities, interests and empowerment,” Thúy told Việt Nam News. “A teacher should only be a guide, a person who orients and rouses their interests. By doing that, teacher will promote students’ ability and help them to feel the need to conquer knowledge by themselves,” Thúy added. She tried to introduce her students and colleagues new rules about the use of smartphones and the internet in studying and teaching English. Through the English language, she created opportunities to connect with people and ideas far away from the old classrooms her students were sitting in. This meant investing her own money in an internet connection and a computer to get the students online. In 2016, she led them on a challenging journey to understand the use of pesticides by local farmers. The harmful chemicals were widely used, despite known links to cancer, which affects people in the village. Thúy worked with her students to research the chemicals, and interview the farmers who use them. They devised alternative growing methods to reduce dependency on pesticides, and educated themselves and their neighbours about the dangers. The impact of this project went far beyond the village. Thúy and her students linked up with students in Japan and Egypt. They were encouraged to undertake their own projects about the pesticides being used in their local areas. It is not only the children who attend the village school who benefit from Thúy’s passion for education. When she started her primary education, she witnessed her teachers visiting her parents because her older brother had been taken out of school. She was determined that lack of funds would not stop other children in her village from learning. She persuaded her parents to sacrifice some of their valuable farming land to build a community learning space. "I always believe that education is the tool to transform our lives, to make a better place for everyone on the planet. Moreover, we are living in the 21st century and on the verge of the 4th Industrial Revolution, therefore necessary living skills need to be taught to our children. In addition, I want my students to learn in the most natural way. Their world is brought into the classroom and they are the ones that set goals for their future," the teacher said. Among many charity works, Thúy also vowed to focus on developing an English library called the Sunflower Library to serve students in local education if she won the 2019 Global Teacher Prize, worth about US$1 million. “The Sunflower Library is free for everyone in the village to use,” Thúy said. She donated her own books for others while setting up an internet connection and providing free classes to the poorest children in her community. Due to the techniques she uses in the classroom, the students can connect with experts and peers around the world. In this way, they begin to see themselves as having the potential to improve their lives and community. “The impact of her teaching is evident in her students’ exam grades, which are above the national average,” the teacher was praised on the website of the Global Teacher Prize. Her students have won prizes in national and international competitions, including the English Contest for Hưng Yên Excellent Students and the English Olympics. Sixty per cent continued to higher education. Thúy also coordinates a network of educators in Việt Nam who share ideas and innovations, and has twice been a presenter at the international VietTESOL conference. Teacher Trần Thị Thúy, 32, from Đức Hợp High School in the northern province of Hưng Yên remembered how her dream started, when she got hold of a bilingual magazine in 1999. A bilingual magazine is one that appears in two languages. “A new world opened up and I was inspired, so I pledged to study English as a way to help myself realise my dream,” said Thúy. If someone, or something, inspires you it makes you want to go out and do something positive. Determination is a strong sense of wanting to get something done. Empowered means “gave her power”. At an English class run by the teacher, students can have presentations in English and communicate directly with others foreign language students and specialists. To communicate means to send messages between people, by talking, writing an email, sending a message and so on. Exploiting the ‘power’ of IT, Thúy has contacted teachers from Japan, Egypt, Pakistan and India to arrange inter-continental lessons via Skype. Her students can share views with students around the globe. The globe is the world. If something is impressive, it is magnificent. A shortlist is a list of people who qualify for being chosen for something special. Annual means happening every year. An initiative is an idea that ends up happening. Creativity means making something using your imagination. Researching means finding out more about something. To deserve something means to be worthy of getting it. A pioneer is someone who is one of the first people to do something that is new. To interact with people means to mix with them and communicate with them. To overcome something means to win over it. Having access to books means being able to get hold of them. Thúy said like many of her peers, at an early age, she often had to help her parents with housework after class. Peers are people who are the same age as you. The then rare bilingual English and Vietnamese newspaper stirred her passion and gave her a glimpse of the world beyond the village. If you have a passion for something, you love it so much that you don’t worry about how much time or money you spend on it. A glimpse is a quick look. A universal language is one spoken all over the world by many people. To be fluent in a language means to be able to speak it well. To orient someone means to persuade them to think and behave in a certain way. To rouse someone’s interests means to make them interested in something. Pesticides are chemicals used to get rid of pests. They devised alternative growing methods to reduce dependency on pesticides, and educated themselves and their neighbours about the dangers. To devise something means to come up with something new. To reduce dependency means to need something less. A sacrifice is something you give up. "I always believe that education is the tool to transform our lives, to make a better place for everyone on the planet. To transform means to change from being one thing into something else. The planet, in this case, is Earth. Earth, like Saturn, Neptune, Mercury, Mars and so on, is a planet in universe. To coordinate means to make things work together with one another. Find words that mean the following in the Word Search. A meeting at which someone asks you all about you or about what you are doing. The time when you were very young. When you are connected to the cyberworld through a computer, you are _ _ _ _ _ _. ANSWERS: 1. Interview; 2. Childhood; 2. Online; 4. Cancer; 5. Egypt.